In many eyes Dr. E. Fuller Torrey is an important and highly respected icon in the mental health care field. In a few others, he is the devil incarnate. Well known for his writing, his work in psychiatry, and his research Dr. Torrey has been a long time proponent of mandatory treatment of the seriously mentally ill—for the good of the individual and the good of society. Sometimes it’s necessary to ruffle a few feathers. In his newest book American Psychosis: How the Federal Government Destroyed the Mental Illness Treatment System Dr. Torrey begins by recounting what has led to the current and grossly inadequate federal mental health care system in order to “understand how we got where we are.” He then emphatically and candidly provides an insider’s perspective of the “Dimensions of the Present Disaster.” He ends this small text with some solid feasible solutions. In 1941, Ambassador Joseph P. Kennedy authorized a lobotomy for his eldest daughter, Rosemary, who was born mildly retarded and suffered schizophrenia-type symptoms as an adult. Something went terribly wrong with the procedure, leaving her profoundly debilitated. Although never publically acknowledged, this catastrophic lobotomy was at least partly what motivated President John F. Kennedy to initiate a federal mental health care program in 1963. This, and the development of useful psychotropic medications, Dr. Torrey explains, kicked off deinstitutionalization, resulting in the loss of 432, 633 beds in state psychiatric hospitals since 1955. And all of the above is still true today. Deinstitutionalization and the failure of putting into place effective and adequate numbers of community mental health centers which President John F. Kennedy originally proposed, resulted in mentally ill individuals living on the streets, in nursing and board-and-care homes, encamped in their family’s basements, and in jails and prisons. There exists no organized funding, other than Medicaid—which was never set up for such a thing—and no single unit of government is taking responsibility. There may be serious disagreement on how mental illness services should be organized and funded, but what’s now in place is insufficient at best. Society is doing a grave injustice to the seriously mentally ill population and to local communities. More and more—50 years later—the effects of deinstitutionalization and the present system of care are obvious. Talk to any family member who’s tried to get their loved one off the streets or out of jail, talk to any individual who has tried to negotiate the mental health care system; and regardless of how they may feel about an individual’s civil rights and forced treatment, they will all agree the system just isn’t working. 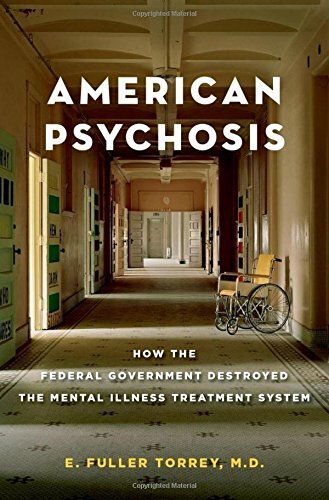 American Psychosis is spot on and a must read for anyone involved in mental health care and anyone in government. In fact, anyone living in American society should read this book. It’s time to recognize and acknowledge this issue; the whole of society is affected. Dr. Torrey is correct: It is time to finally do so.